To some extent, the alkanolamides that make shampoos foam also make the formulations thicker. However, other materials are also used to increase the viscosity. For example, methylcellulose, derived from plant cellulose, is included in shampoos to make them thicker. Sodium chloride (salt) also can be used to increase shampoo thickness. Some materials are also added to shampoos to offset the sometimes harsh effect of surfactants on hair and fabrics. Typical conditioning agents include polymers, silicones, and quaternary agents. Each of these compounds deposit on the surface of the hair and improve its feel, softness, and combability, while reducing static charge. Shampoos that specifically feature conditioning as a benefit are called 2 in 1 shampoos because they clean and condition hair in the same step. Examples of conditioning agents include guar hydroxypropyltrimonium chloride which is a polymer, dimethicone which is a silicone, and quatemium 80, a quatemary agent. Since shampoos are made from water and organic compounds, contamination from bacteria and other microbes is possible. Preservatives are added to prevent such growth. Two of the most common preservatives used in shampoos are DMDM hydantoin and methylparaben. Other ingredients are added to shampoo formulas to modify specific characteristics. Opacifiers are added to make the formula opaque and give it a pearly look. Materials known as sequestering agents are added to offset the dulling effects of hard water. Acids or bases such as citric acid or sodium hydroxide are added to adjust the pH of a shampoo so the detergents will provide optimal cleaning. One of the primary factors that influence the purchase of a shampoo is its color and odor. To modify these characteristics, manufacturers add fragrance oils and governmentally approved and certified FD C dyes. Other special additives can also have a similar effect. Natural materials such as botanical extracts, natural oils, proteins, and vitamins all impart special qualities and help sell shampoos. 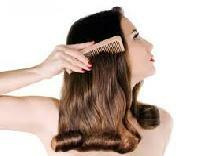 Additives such as zinc pyrithione are included to address the problem of dandruff. Other additives are dyes which can color the hair. After a shampoo formula is developed, it is tested to ensure that its qualities will minimally change over time. This type of testing, called stability testing, is primarily used to detect physical changes in such things as color, odor, and thickness. See whether you are using the proper shampoo for your hair type. Is your hair fine, dry, oily or did you see some dandruff flakes lately? Since shampoos are made from water and organic compounds, contamination from bacteria and other microbes is possible. Preservatives are added to prevent such growth. Two of the most common preservatives used in shampoos are DMDM hydantoin and methylparaben. An about half inch wide dollop of shampoo (about the volume of a hazelnut should be enough for short to medium long hair. Adjust this amount accordingly if you wear your hair long. Distribute the shampoo through your hair. Some materials are also added to shampoos to offset the sometimes harsh effect of surfactants on hair and fabrics. Typical conditioning agents include polymers, silicones, and quaternary agents. Each of these compounds deposit on the surface of the hair and improve its feel, softness, and combability, while reducing static charge. Foam up the dollop of shampoo with a little water before massaging the foaming shampoo through your hair and over the scalp with circulating movements. Be sure not to scratch your scalp with your fingernails. Shampoos that specifically feature conditioning as a benefit are called 2 in 1 shampoos because they clean and condition hair in the same step. Examples of conditioning agents include guar hydroxypropyltrimonium chloride which is a polymer, dimethicone which is a silicone, and quatemium 80, a quatemary agent. Wet hair is very sensitive and you should therefore abstain from towelling or rubbing it dry. Instead, simply press a towel on your hair. The towel will absorb excess water without moving it back and forth and damaging your hair in the process.